November is here and it brought the cold weather with it. Hopefully you all are warm and cozy in your craft rooms and crafting away. I’m sharing Cathy’s Hello. I’m a Paper Addict room with you today. She’s inspired a couple of our organizational posts but we haven’t shared her room with you yet. Cathy is very into Project Life, Smashbook and Filofax and she’s taking full advantage of 2 Raskog carts to keep it all right at her fingertips! Here’s a closeup of the tray holding her stamps. She found her’s at Home Goods but I see these all the time in second hand stores. Perfect for wood stamps. Washi anyone? I thought I had an obsession. LOL. Cathy recommends the vareria box from Ikea for organization and has these across the back of her desk. I hope you enjoyed these little snippets from Cathy’s craftroom. There’s lots more to see. HERE is the link to all these pics/posts and more details of the making of her room. Hello to all my fellow storage enthusiasts. It’s Hazel all the way from Sunny SA to share a cyber storage tip that makes a LOT of sense – storing Washi tape that comes with a kit. 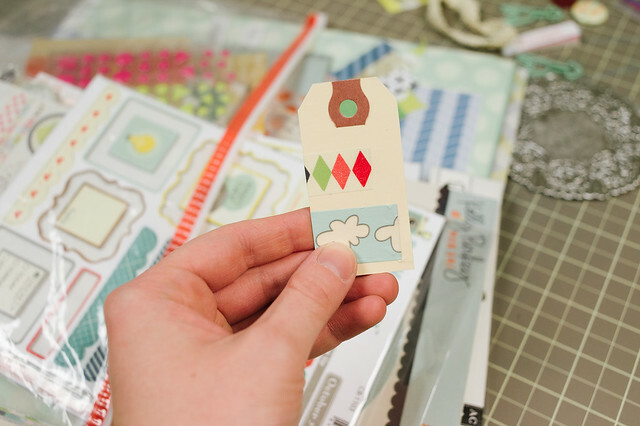 Buy shipping tags in bulk / make your own, add a piece of each Washi included in your kit to it and store it with the kit while the rolls gets filed away in your Washi stash. GREAT IDEA!!! That’s it!! I’m off to file away my “Kit Washi”. Thanks for looking at Craft Storage Ideas with me today. Have a great week and please check back for more great storage ideas. Today I am bringing you a very practical, economical and pretty daring DIY. How many times do you toss out old boxes? Once you see these pretty boxes, you are going to want to hoard hold on to your extra boxes. 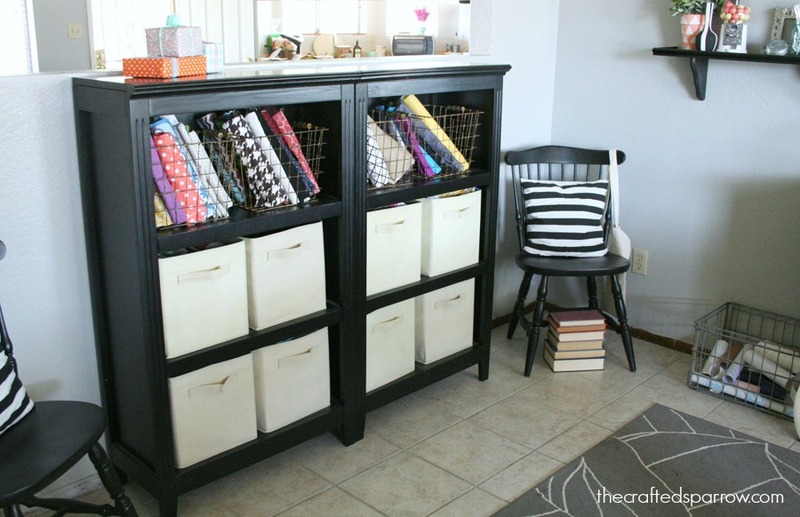 Simply cover the boxes with pretty paper and you have customized, beautiful drawer storage. And who can’t use more of that? Rebecca at Soap Deli News Blog did just that! She used pretty scrapbook paper to cover all of her boxes as well as the larger box she recovered. You don’t even need drawer space to make this fun project work! You could also cover your boxes with wrapping paper, contact paper, or vinyl. I love that the small size boxes perfectly house her washi tape collection and you can easily see all of them. Head over to Soap Deli News Blog to check out the full instructions. Hi! It’s Laura here with a quick tip for you. 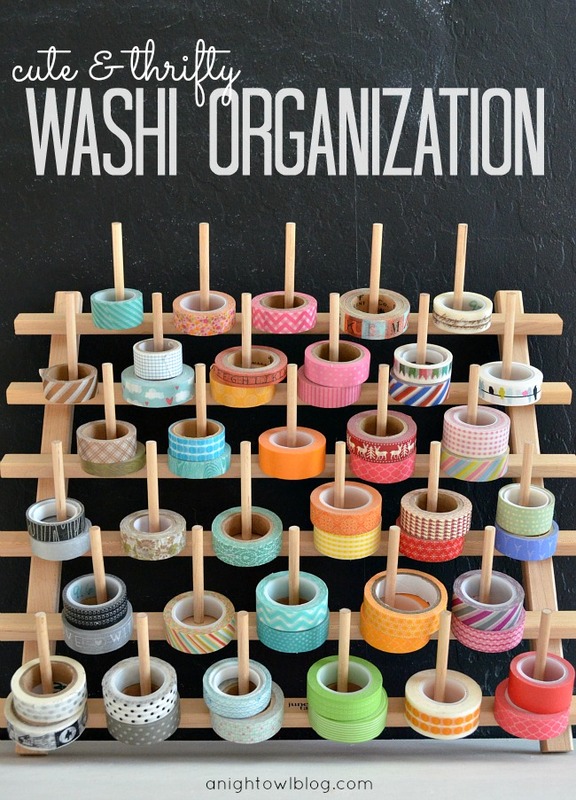 I have shared before a few different ways to store your washi tape collection. If you are anything like me, once you get a couple rolls of washi tape, you soon start collecting it – there are so many fun patterns and colors to choose from – and your rolls can start over taking your space. I like to always try to search my home for items to use for storage before I go out and buy something new. 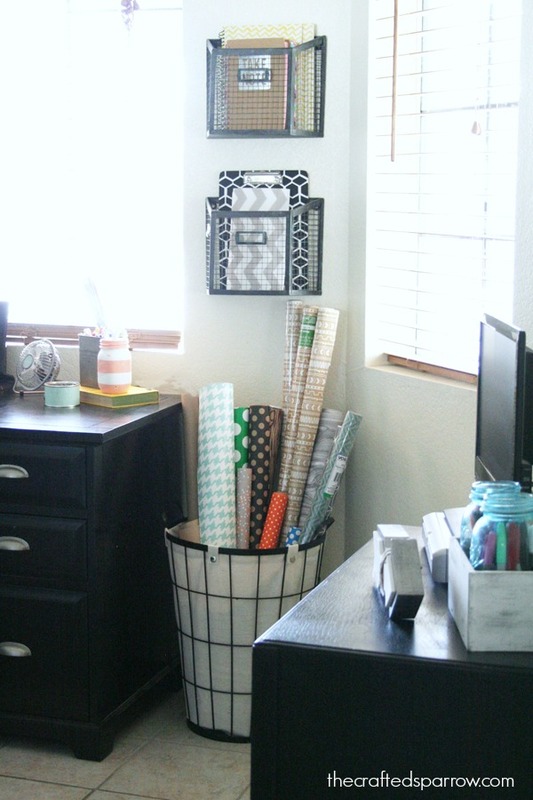 Elizabeth at Sew Chatty cleverly used a repurposed wire coat hanger to store her growing washi tape collection! It is functional and can be moved around easily. And she made it pretty by covering the wire with washi tape! I love all the colors. Now I am off to see if I can round up a wire hanger! This wonderful craft studio belongs to Debee Campos, who has graciously allowed me to feature some of her photos in my post for today. I love how she chose to keep the main color scheme white, because it really makes the other splashes of color POP! 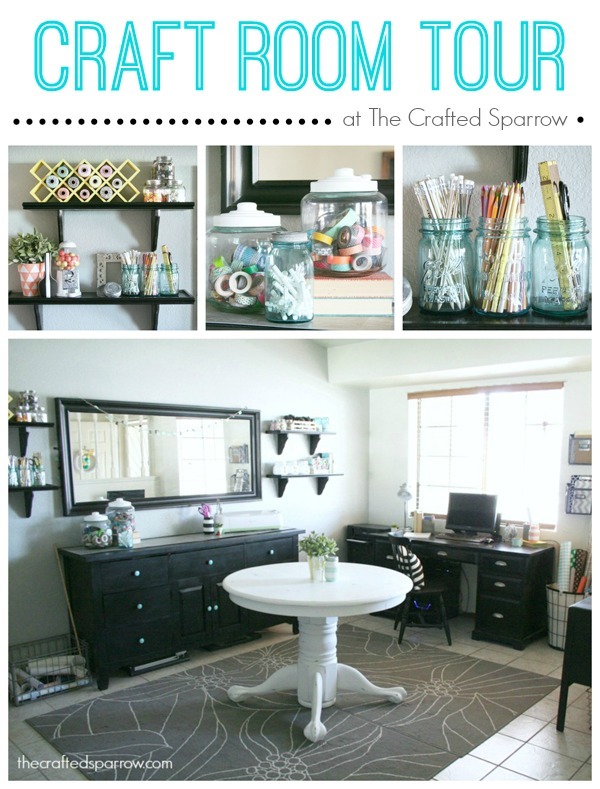 Check out this nook she created using some pieces from Michael’s and IKEA. I love that she’s been able to make use of every square inch of space in such a small area! There is so much to love about this next photo. I love, love, love the cubbies – along with the goodies in them – but I ADORE the mismatched knobs she’s used on the dresser below. 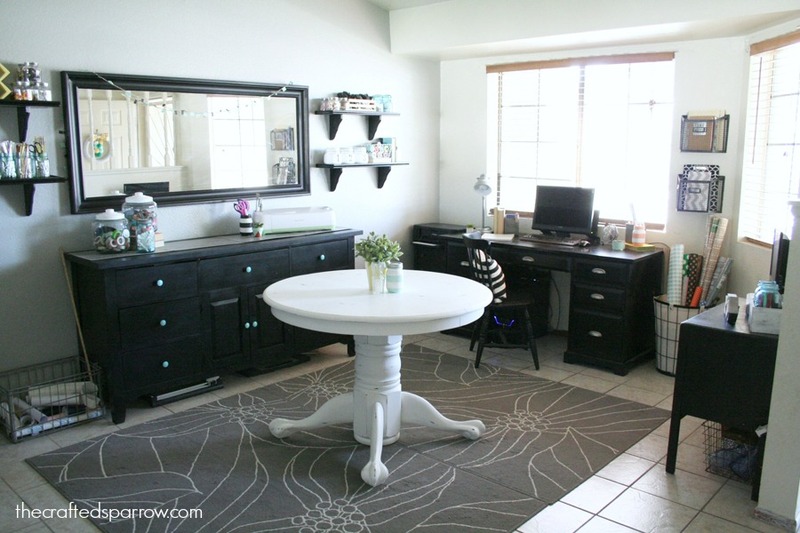 Thanks again, Debee, for allowing me to feature your studio in my post today! You’ll want to be sure to check out her blog to see even more amazing photos of her studio, and for more detailed info on how she pulled everything together.